The brain contains about 40 billion nerve cells, known as neurons, which are held in place and supported by Glial cells. Glioma is a general name for tumours that develop from glial cells, this supportive tissue of the brain. Tumour types are named after the cells from which they arise. 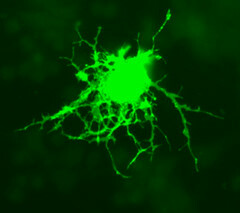 Astrocytomas develop from astrocyte cells (see image, left). Astrocytes are three dimensional star-shaped cells which form a network around neurons, and are now thought to be involved in almost all aspects of brain function. They have a critical role in maintaining the right environment in your brain, so that the neurons can function properly. For example, astrocytes are thought to play an important role in keeping the synapses (small gaps across which chemical information is passed) between neurons functioning correctly. Astrocytes generate chemical signals sometimes called â€œgliotransmittersâ€, which can inhibit, stimulate, or fine-tune the messages passed between neurons. Each astrocyte may interact with several neurons and hundreds to thousands of synapses to integrate information effectively. In addition, the â€œfeetâ€ of astroyctes connect to blood vessels in the brain, and by signalling blood vessels to expand or narrow, astrocytes also regulate local blood flow to provide oxygen and nutrients to neurons. There is growing evidence that astrocytes can even alter how a neuron is built, by directing where to make synapses or dendritic spines. They can also attract new cells to their territory (like immune cells and perhaps even adult neural stem cells) to repair any damage. Oligodendrogliomas develop from oligodendrocytes (see image, right). These are cells that wrap tightly arou nd axons (the parts of neurons which look like â€œarmsâ€) to form the myelin sheath. The myelin sheath speeds up the electrical communication signal that travels down an axon. Without oligodendrocytes the signal would travel down an axon 30 times slower! It is also possible to have a â€œmixed gliomaâ€ or â€œoligoastrocytomaâ€, which contains both astrocytes and oligodendrocytes. Ependymoma cells line the ventricles of the brain (ventricles being the hollow spaces in your brain that contain Cerebrospinal fluid), the central canal of the spinal cord, and the filum terminale (a thread-like structure within the lower end of the spinal cord). A Meningioma is a tumour of the meninges, which are the protective membranes around the brain and spinal cord. The term "High-Grade" refers to the definition given by the WHO (World Health Organisation) grading system for brain tumours. WHO Grades III (3) and IV (4) indicate a high-grade Brain Tumour in which cells are dividing rapidly, and therefore a tumour that is growing more quickly. High-grade brain tumours can be found in both adults and children. * Although classified as gliomas, ependymomas are uncommon idiosyncratic circumscribed tumours that are regarded clinically and therapeutically as distinct from gliomas of astrocytic or oligodendroglial lineage. There is also uncertainty about the clinicopathological value of distinguishing between classic (WHO grade 2) and anaplastic (WHO grade 3) ependymomas. Source: NICE Guidelines - Improving Outcomes for People with Brain and Other CNS Tumours, June 2006. Table 1. Based on World Health Organization classification of tumours. Kleihues P, Cavenee WK (2000) Pathology and Genetics of Tumours of the Nervous System. Lyon: IARC Press. What are primary and secondary brain tumours? Primary brain tumors originate in the brain, mostly from the glia, for example: astrocytes, oligodendrocytes or ependymal cells. Different from other Cancer types, metastasis in primary brain tumors is rare. When they do, the Tumor cells spread through cerebrospinal fluid, rather than to other organs by the bloodstream. Secondary brain tumors originate from Malignant tumors located in other body organs. These are also known as metastatic brain tumors. They reach the brain through the bloodstream. Secondary brain tumors may be either benign or malignant. Symptoms may vary and many benign tumors are Asymptomatic for years. The symptoms will vary with each individual and depending on the size and location of the tumour. Some people may experience all, some or none of the symptoms. The first of these may be a headache (due to increased pressure in the head), seizures or weakness, numbness or speech problems. Investigation of a suspected brain tumour follows a standardised procedure. A good neurological examination is essential, followed by some combination of the following tests, depending on the need and availability. Â· CT (Computed Tomography) brain scan is a specialised x-ray. It will take 20-30 minutes. An injection into the back of your hand of a dye to act as a contrast may be given to obtain the clearest picture of the tumour. Â· MRI (Magnetic Resonance Imaging) brain scan is a specialised imaging technique that gives very clear pictures of the brain and will show the site and extent of the tumour. It usually takes 30 to 40 minutes and uses magnetism instead of x-rays. People with pacemakers cannot have this test and those with any other metallic implant should inform the medical team well before the test. How common are these tumours and who gets them? Unfortunately the cause of High Grade brain tumours remains unknown. There do not appear to be any links with occupation, infections or head injury and research has not proved a hereditary link. Organisations like Brain Tumour UK, and others in the voluntary sector, are working tirelessly to fund research projects to try and find a cure for this devastating condition. Around 9,100 people are diagnosed with a primary brain tumour in the UK annually. About 70% to 80% of primary brain tumours are High Grade Gliomas. They occur most often between the ages of 46 and 50, affecting men more often than women. What treatment might be available? Your medical team will plan your treatment taking in to consideration your general health, your symptoms and the size and position of the tumour. It depends on the individual. Your Consultant may recommend that you undergo surgery to enable him or her to take a biopsy from your tumour, if it is in an accessible part of the brain, so that the type and grade of tumour can be confirmed by studying the cells under a microscope. Having a biopsy will mean a hospital stay, as it is done under general anaesthetic. First, a CT or MRI brain scan is done to find the exact position of the tumour. During the operation a small hole, called a burr hole, is made in the skull. A fine needle is then passed down through the burr hole to remove tiny pieces of the tumour, which are then sent to the laboratory and examined by the pathologist under a microscope. Only once cells have been studied under a microscope can the tumour be accurately diagnosed. The grade and tumour type will then be used to decide which type of treatment is most suited to your particular situation; options usually include surgery, Radiotherapy and/or Chemotherapy. A Craniotomy or Awake Craniotomy is an operation where a disc of bone is removed from the skull using special tools to allow access to the underlying brain for removal of as much of the brain tumour as possible. Benarroch EE. 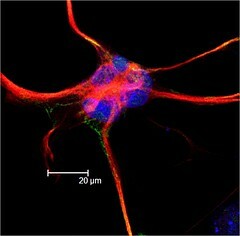 (2005) Neuron-astrocyte interactions: partnership for normal function and disease in the Central Nervous System. Mayo Clin Proc. 2005 Oct;80(10):1326-38. Smith JS, Chang EF, Lamborn KR, Chang SM, Prados MD, Cha S, Tihan T, Vandenberg S, McDermott MW, Berger MS. (2008) Role of extent of resection in the long-term outcome of low-grade hemispheric gliomas. J Clin Oncol. 2008 Mar 10;26(8):1338-45.